Even with a resolution of the territorial dispute between Russia and Japan the relations between the two will change little, at least in the short to medium term. On December 15th, Japan's Prime-Minister Abe and Russia's President Putin will meet in Abe's home prefecture Yamaguchi to hold talks that may bring a breakthrough in the territorial dispute between the two countries. This will pave the way for a conclusion of a peace treaty between the two countries and full normalization of bilateral relations. Japan has territorial disputes over groups of islands with all of its neighbours-China/Taiwan, South Korea and Russia. The dispute over the"Northern Territories" as they are known in Japan or the South Kuriles in Russia, is over four islands located to the east of Japan's Hokkaido: Habomai which is actually an archipelago, Shikotan, Kunashir/Kunashiri and Iturup/Etorofu. Among all the three disputed territories that involve Japan,"Northern Territories" are the only ones that are inhabited with a population of about 17,000. The"Northern Territories" are also the closest to Japan proper and the largest among the three with a combined territory of 5000 sq.km. Despite the size and the proximity however, during the last decade, the territorial dispute with Russia has created far fewer tensions in bilateral relations than the other two disputes did for Japan's relations with China and South Korea. Nevertheless, the territorial dispute is the main stumbling stone in Japan-Russia relations and since the end of World War II has precluded a conclusion of a peace treaty between Japan and USSR/Russia. The four islands claimed by Japan were occupied by the Soviet Union along with all of the Kurile Islands in the waning days of the war in the Asia-Pacific. In 1946-7, the Soviet authorities expelled all of the Japanese residents and unilaterally annexed the islands. In the 1951 San-Francisco Peace Treaty which was not signed by the Soviet Union, Japan renounced all right, title and claim to the Kurile Islands. Since mid-1950s however, Japan has claimed the four islands as its territory illegally occupied by USSR. Japan's position states that the four islands are not included in the scope of the"Kurile Islands" renounced in the Peace Treaty because the two small islands of Habomai and Shikotan have always been part of its Hokkaido Prefecture and the two larger islands of Kunashiri and Etorofu are actually"Southern Chishima" islands and not part of the"Kurile Islands". On the other hand, USSR and later Russia argue that the acquisition was made in accordance with various wartime agreements among the Allies, most importantly the 1945 Yalta Conference. In 1956, Japan and USSR signed a Joint Declaration that ended the state of war between the two countries. As such, today's Japan and Russia are not officially or technically in a state of war as some mistakenly think (Kobayashi 2013). The Joint Declaration however did not settle the territorial dispute. It did re-establish diplomatic relations between the two countries and included a promise by the Soviet Union to transfer Habomai and Shikotan to Japan after the conclusion of a Peace Treaty. In 1960 however, after the renewal of the US-Japan Security Treaty, the Soviet Union revoked this promise. Later on, the Soviet Union adopted the position that all territorial issues with Japan are resolved and denied the existence of the dispute all together. It was only in the late 1980s, during Gorbachev's reforms, that the Soviet leadership admitted the existence of the dispute. Since then, the leaders of Japan and USSR (and since 1992, Russia) have engaged in numerous attempts to resolve the territorial dispute and fully normalize the bilateral relations. So far however, the negotiations have proven fruitless. Russia's position evolved from the Soviet-era denial of the existence of any territorial dispute to admittance of the existence of the dispute, toward willingness to return the two small islands to Japan in accordance with the 1956 Declaration and to engage in negotiations regarding the status of the other two under Putin. On the other hand, Japan did introduce important changes in its economic policy towards Russia but has been unwilling to compromise in terms of the scope of the territory it demands to be returned. Namely, various plans that came from Japan's Ministry of Foreign Affairs expressed flexibility regarding the timing and modalities of the return of the islands, but the underlying demand for the return of all of the four islands remained unchanged (Bukh 2009). Since the series of corruption related scandals in Japan's Ministry of Foreign Affairs (MoFA) that erupted in 2002 and virtually paralyzed Japan's Russia policy because all the key players were purged, the bilateral negotiations entered a dormant season and existed in this state till recently. It was only under Shinzō Abe's second premiership that Japan's Russia policy started to evolve as part of PM Abe's broad attempt to fundamentally revise Japan's international standing. PM Abe and the"New Approach"
PM Abe has set as one of his foreign policy goals to achieve a breakthrough in the territorial dispute with Russia by developing close personal relations with President Putin. He was one of the few leaders of OECD countries and the only Head of State from a G7 country to attend the opening ceremony of the Sochi Olympics in 2014. 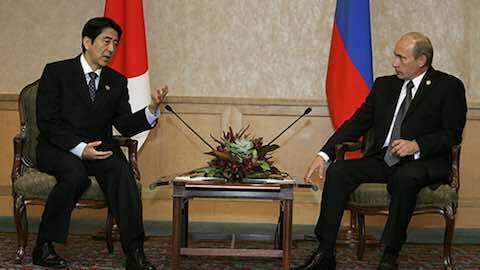 Overall, since 2012, PM Abe has met President Putin fourteen times, more than any other Head of State. PM Abe's efforts stated to bear fruit recently when during his last meeting with President Putin in Sochi in May 2016, the two leaders agreed to implement a"new approach" introduced by PM Abe to the territorial dispute. The exact details of this new approach are still not completely clear but it has been reported that the Japanese plan envisages an extensive economic assistance to the Russian Far East that will include transfer of medical knowhow, development of Russia's postal system based on the Japanese one, joint projects, loans through Japan's Bank of International Cooperation and various other measures to encourage investment in Russia by Japan's small and medium sized businesses. A creation of a new ministerial post, a Minister for Economic Cooperation with Russia, in September 2016 underlies the centrality of economic assistance in PM Abe's Russia related strategy. In terms of the territorial dispute, the Japanese media reported that the government considers a settlement that will involve a transfer of the two small islands of Shikotan and Habomai to Japan and a joint administration of the other two. They also reported that Japan may promise not to allow stationing of US troops on the islands as part of the settlement. If this information is true, it is definitely possible that the 15th December Abe-Putin Summit will become a truly historical event during which the two leaders will reach an agreement on the territorial dispute or, at the very least, will achieve a major breakthrough. There are obviously numerous reasons to be sceptical about such a breakthrough in the territorial dispute. The fact that the information about Japan's government plans for joint administration of two islands appears in the media without being attributed to a particular source, as well as the governmental official rebuttal of such plans suggests that there is a certain struggle within the policy making establishment. It is possible that similarly to the 2001 scandals in MoFA, certain members of the establishment are dissatisfied with a compromise and leaked the information to the media with a hope to undermine such a settlement. PM Abe is much stronger than his predecessors in terms of support rate, overall leadership and also the degree of control over bureaucracy, but if all the above is true, it remains to be seen whether he will be able to overcome this internal resistance. Secondly, it is unclear whether this kind of a settlement will be acceptable to President Putin. Today, there are no individuals or institutions inside Russia that exercise significant influence over Putin and can stop him from adopting one policy or another. Russian economy weakened by the sanctions and the low prices of oil will definitely benefit from Japanese loans, Japan's investment and transfer of knowhow and technology. It is unclear, however, whether President Putin whose popularity depends on strongly nationalistic policies and manifestations of state power domestically and internationally, will be willing to consider joint administration of two islands as this can be seen as a sign of weakness by the domestic audience. Furthermore, joint administration of an inhabited territory is a rather complicated endeavour and would require a detailed agreement on various issues such as defence and military stationing on the islands, laws to be applied and their enforcement, movement of people and taxes. Even if the two leaders reach a broad agreement, each of these and other issues that will need to be agreed upon by the two parties may prevent a conclusion of the actual settlement. Nevertheless, a final settlement of the territorial dispute and a full normalization of bilateral relations between Japan and Russia is possible and it is important to consider how their relations will develop when and if this settlement materializes. First, let us consider the factors behind the two leaders' desire to solve the territorial dispute. For President Putin, any development that breaches the political West's unity in its Russia policy is a welcomed one. The most important reason for fostering closer relations with Japan however is economic. Economic assistance from Japan may provide a certain boost to the Russian economy and also facilitate the development of Russia's Far East which has been one of the main priorities of the Russian government. For PM Abe, there is definitely a personal ambition to solve a problem that many of Japanese politicians including his own father, Abe Shintaro, Japan's Minister of Foreign Affairs in the 1980s, tried to solve but failed to do so. Second, the resolution of the territorial dispute with Russia can be seen as the next step in PM Abe's strategy to solve the numerous war related issues that hinder Japan's relations with its neighbours and to pave the way for a more proactive foreign policy. Last year PM Abe and South Korea's President Park reached an agreement on the so-called"comfort women" controversy. Negotiations with Russia can be seen as the next step in this strategy. The desire to solve the"Northern Territories" problem can also be seen as an attempt to score a diplomatic victory that will divert people's attention from domestic issues and boost PM Abe's support. So far, PM Abe's main source of domestic support has been his economic policy (the so-called Abenomics) but recently it suffered a setback on a number of important issues. The most important factor in PM Abe's attempt to improve relations with Russia is the China factor. Namely, the territorial dispute over the Senkaku/Diaoyu islands with China and the broader rivalry between the two countries for leadership in Asia is the most important matter of concern for Japan's defence and foreign policies. Fostering better relations with Russia may be seen as an attempt to weaken Russia's partnership with China and prevent an emergence of China-Russia military alliance in East Asia. What will be the effects of the settlement if and when it happens? In Japan, the solution of the territorial dispute will probably be received positively by the majority of the domestic audience despite the criticism and accusations of betrayal of national interests that will be voiced by some right-leaning pundits. Similar criticism will probably be voiced in Russia as well and possibly President Putin's domestic support rates will slightly decline. However, a carefully designed media campaign that could include an exalted reports of another victory in Syria or reports about the"horrors" in the Ukraine, will quickly cause most of Russians to forget about distant islands they have never visited and know very little about. The Russian economy as a whole will gain certain benefits from access to Japanese loans and Russia's Far East will benefit from Japanese investment in infrastructure and knowhow transfer. Overall however it is hard to imagine that the Japanese businesses will race to invest in Russia after the conclusion of a Peace Treaty. Surveys of Japanese businesses have shown that the territorial dispute is a minor factor in their Russia related investment policy and other factors such as corruption and lack of proper legal infrastructure play a much more important role. It is also hard to imagine significant changes in the defence relations between the two countries and close cooperation on important international issues. Indeed, China's power is a matter of long-term concern for Russia's policy makers and some kind of Japan-Russia security cooperation in the distant future is a possibility. However, as long as the security treaty with the US remains the main pillar of Japan's foreign policy; and Russia and China remain in a"soft" alliance aimed at curtailing US power and influence, close security ties between Japan and Russia are rather improbable. To summarize, a resolution of the territorial dispute and Japan's government led extensive economic assistance program will probably have some positive effects on bilateral relations and will bring certain benefits to Russia's economy. Overall however, the transformations will be mostly cosmetic and the relations between the two neighbours will change little, at least in the short to medium term. Bukh, Alexander. Japan’s national identity and foreign policy: Russia as Japan’s’ other’. Oxon: Routledge, 2009. Alexander Bukh is a Senior Lecturer in International Relations at Victoria University of Wellington, New Zealand. Alexander has published numerous academic articles and book chapters on Japan-Russia relations, Japan's national identity and territorial disputes in Northeast Asia. His recent publications include articles in the Pacific Review, Asian Perspective and International Relations of the Asia-Pacific. Alexander is the author of"Japan's Identity and Foreign Policy: Russia as Japan's Other" (Routledge 2009). "The Future of Japan - Russia Relations"